The drive to Oventic is nauseating for the same reason it’s beautiful. The road winds through the dramatic green hills of Los Altos de Chiapas, a region of Mexico’s southernmost state known for extreme poverty and a revolutionary history. Rocky bluffs rise above farms scattered on impossibly steep hillsides, as the road occasionally passes small villages populated by Tzotzil and Tzeltal indigenous communities. At almost every turn, inconveniently placed speed bumps cause the taxi driver to slam on the brakes. 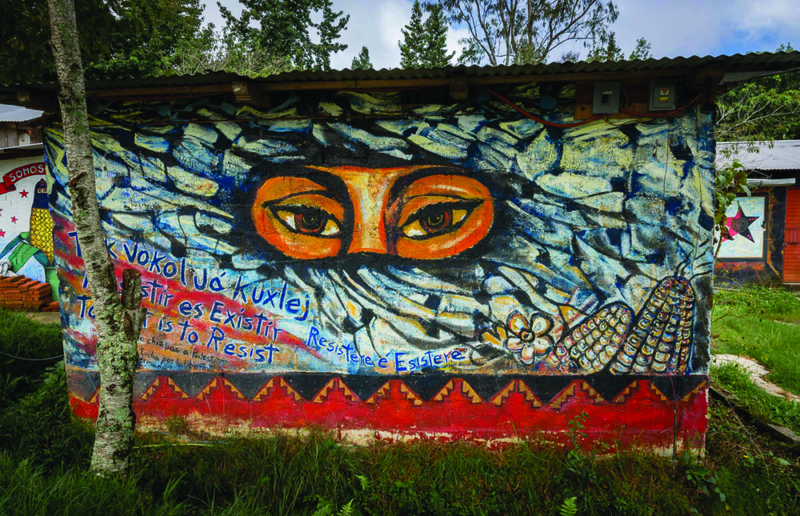 Oventic is one of five caracoles: political centers of the Zapatista movement, one of the most successful and notorious anti-capitalist movements in the world. In 1994, the Zapatistas, then an unknown bunch of indigenous campesinos (rural farmers), staged an armed uprising against the Mexican state. They didn’t topple the Mexican government, clearly, but they did gain effective autonomy from it. Since then, they have been living in communities in the remote hills and jungles of Chiapas under a radically egalitarian political system. The Zapatistas are shrouded in mystery and known to be suspicious of outsiders. But with a little bit of googling in Spanish, you can figure out how to get to Oventic by taxi from San Cristóbal de las Casas, the nearest city. That’s what my friend Ethan Cutler and I did one sweltering afternoon in late May. As we climbed out of the taxi to get our first glance of Oventic, we suffered a strange vertigo, a combination of leftover nausea from the drive and shock from arriving at the place we’d been wondering about for months. Mostly, we felt profoundly uncomfortable. Here we were, two white kids from the United States, left on the side of the road to figure out the world of the compas (comrades) and the juntas de buen gobierno (councils of good government). “What are we doing here?” I wondered. II. Is There No Alternative? Ethan and I are both philosophy majors who loosely, somewhat hesitantly, and often self-consciously call ourselves anti-capitalists. We’ve spent the past few years in classrooms learning about the innumerable injustices that plague the world. Like many college students who’ve read a few pages of Foucault or Marx, we’ve come to realize that cases of injustice are not isolated incidents. Rather, their immediate cause is the structure of political and economic policies that proliferate across the globe—policies that privilege private property as the inalienable foundation of everything in our social world. The basic anti-capitalist critiques are not all that complicated to understand: capitalism rests upon the exploitation of a lower class, and it’s inextricably tied to racism and colonialism. It also alienates us from ourselves, our communities, and our relationships with the natural world. Ethan and I were swayed, at least intellectually, by the revolutionary lingo that promised a way out of all that. But, like many other young idealists eager to take action against the system, we were dismayed by how distant any alternative to capitalism seemed. Theorists critique capitalism ruthlessly and convincingly, but rarely offer viable solutions. For all our gusto, Ethan and I still hadn’t figured out a way to dismiss the most basic pro-capitalist argument: all attempts in history to topple capitalism have either failed embarrassingly, been stopped almost immediately, or devolved into totalitarianism and oppression. The argument, as neoliberal icon Margaret Thatcher put it, is that “there is no alternative.” That prospect had left Ethan and I in an intellectual and practical bind. If nothing else is feasible, what’s the point of even trying to work towards overthrowing the system? The Zapatista movement seemed to counter that pessimism. As if in direct response to Thatcher, one of their rallying cries is, “Another world is possible.” We read dispatches that the Zapatistas issued from the jungles of Chiapas, in which they outline their fight for basic demands. They write that they “do not seek the victory of one party or another.” Rather, they seek “justice, freedom, and democracy,” and “to fight along with everyone who [is] humble and simple.” To the ears of a political realist, these words seem far too simple to be honest. But from everything we read, it seemed they really did fight for those ideals. And they won. Leftist intellectuals around the world extol the Zapatistas’ political system as the best living example of “anarcho-communism” or “libertarian Marxism” or “collectivist democracy,” or whatever that particular commentator’s favorite ideology happens to be. Leftists closer to the movement tend to avoid categorizing it with an ideological label, but they still portray it as a shining beacon of revolutionary light in a world of neoliberal darkness. Tom Hayden, a longtime Zapatista scholar, writes that, “In their actions and writings, the Zapatistas are inspiring a new generation to join the struggle for a better world.” Hayden adds, “It’s our world too!” Commentators like Hayden appeal to the supposedly universal character of the movement’s ideals, sometimes suggesting that anyone can be a part of the Zapatista movement, other times suggesting that it could be replicated elsewhere. We had come to Chiapas thinking that if we could better understand the Zapatistas’ ideology, we could return with a real-world example to wave in the Thatcherites’ faces and somehow apply to our own political situation. If the Zapatistas had done it—stood up to capitalism and found something else that works—then there had to be hope for us, too. Maybe, we thought, there’s some key to successful anti-capitalism that we just aren’t seeing. Maybe another world is possible. In December 1993, just before their initial uprising, the Zapatistas issued their “First Declaration of the Lacandon Jungle,” also called the “Zapatista Manifesto.” The first line is, “We are a product of 500 years of struggle,” referring to the start of colonialism in the sixteenth century. Spanish colonizers nearly wiped out the indigenous population of Chiapas with diseases, wars, and the systematic expulsion of the native people from their homelands. They conscripted surviving indigenous people to serfdom and slavery. The ensuing centuries were a constant struggle between indigenous people fighting for their land and dignity, and rich landowners backed by the state. As Mexico’s economy grew in the twentieth century, the north radically urbanized, elites prospered, and campesinos in Chiapas continued to lose hold on what had once been their land. The population of Chiapas became the least educated and the poorest in Mexico. Indigenous people either remained conscripted to labor on ranches or were forced to migrate to the cities to find work in spite of a fierce racism that limited their opportunities. The Zapatista Army of National Liberation (EZLN) staged their initial uprising on January 1, 1994—the same date that the North American Free Trade Act (NAFTA) went into effect. NAFTA symbolized the worst of neoliberalism: it called for privatization of state-owned enterprises, and abolished legal protections for land-holdings called ejidos. The ejidos had allowed poor farmers to collectively own land that could not be bought or sold. The Zapatistas believed NAFTA would exacerbate inequality and open the gates for multinational corporations to buy off what little land indigenous people had left. So, with an army of 3,000 indigenous campesinos-turned-combatants, they marched in from the hills and took control of several towns throughout Chiapas. The Zapatistas freed prisoners from the jail in San Cristóbal and set fire to police and military buildings in other small cities. In the campo (countryside), they destroyed ranch-houses and reclaimed large expanses of land. They took land from the rich and gave to the poor. The Zapatistas were certainly an unconventional guerilla army—some didn’t even carry real guns, but instead, fake rifles carved out of wood. Up to one third of the fighters were women. They had no formal leader, just a mestizo spokesperson known only by his nom de guerre Subcomandante Marcos. He spoke in riddles and was never seen without a balaclava over his face and a pipe in his mouth. The media characterized them as ominous, dangerous, clandestine guerillas ready to attack and destroy. The Mexican government treated them as a violent enemy of the state, sending military forces that attacked without restraint, killing 145 indigenous compas. The initial fighting lasted only 12 days—the Zapatistas were fighting a losing battle. But they were not to be filed away on the dusty shelves of the world’s many forgotten leftist movements. In 1996, the government and the EZLN reached an agreement called the San Andrés Accords, which stipulated that the government would recognize a bill of indigenous rights. The Zapatistas would be allowed to retain most of the territory they had gained in the uprising and would be granted the ability to govern it according to their own rules and customs. But when the time came to push the new accords through Congress, the ruling party failed to pass them. Since then, the Zapatistas have maintained de facto autonomy, despite years of violent threats from government-backed paramilitary groups. Despite the continued onslaughts, the Zapatistas have retained their land. And today, 24 years after the uprising, they govern that expanse of territory with a political system based on a radically horizontal power structure. The territory is divided into five zones called caracoles, each of which is led by a body of rotating elected representatives called a junta de buen gobierno (council of good government). Though this intensely communicative form of democracy often moves at a snail's pace (it involves representatives travelling back and forth to multiple communities on a regular basis to talk with individual families before decisions are made), it has allowed the Zapatistas to constructed their own unique systems of education, health, and justice. They have also devised a system of trade based on agricultural cooperatives, which grant their farmers relative independence from the demands of the global market. All of this depends on the people holding their representatives accountable—they can vote people out at any time—a concept the Zapatistas call mandar obedeciendo (govern by obeying). After a century of suffering the damages of broken political promises under a system that claimed to be a democracy, the Zapatistas are wary of the corruption of modern politics. They believe that it takes more than votes to make democracy—it takes community. Ethan and I stood at the gates of Oventic, nauseous and self-conscious, hoping to get a glimpse into this leftist dream. Two unarmed guards in black balaclavas sat behind a tiny wooden booth to the left of a metal gate. One of them was wearing a New York Yankees hat, which struck us as somewhat ironic considering that the Zapatista movement opposes American imperialism. The guards at the gate spoke sparingly. They eyed us up and down for a few moments, then one disappeared and brought back two women, also clad in balaclavas. After explaining that we were students who wanted to learn about the movement, we filled out some paperwork on a clipboard. They went back into the village, deliberated, and apparently decided we were acceptable. A Zapatista named Compañero Antonio opened the gate. He showed us the buildings and briefly explained their functions—the clinic that served everyone in the Oventic region, the primary schools, the buildings where committees from various villages gathered to meet, the church where families prayed together on the pew-less, pine-needle-covered floor. When we tried to ask more about how the junta functioned, about who the people in the village were, and how they related to the outside world, Compañero Antonio said that we’d have to ask the junta. We tried some less sensitive questions, but he answered us with silence. Unsure of what else to do, we left Oventic after a half hour or so. Although our visit was even more brief than we had imagined it would be, we weren’t exactly surprised—we had already learned that the movement and the people surrounding it were highly suspicious of outsiders, especially those from the United States (and for good reason). From what we’d read online and heard in town, we knew the visit to Oventic would probably be a brief, guided tour. We were grateful to have the chance to see it, but we still didn’t have any answers to our questions about how the Zapatistas’ daily lives actually worked. Nor could we draw any conclusions about how we were supposed to respond to calls to join the struggle. The Zapatistas did seem to exist in another world, but it was a world so different and closed-off that we weren’t sure how it could possibly relate to the one we knew. It was this confusion that brought us to the living room table of a nondescript building in San Cristóbal, drinking tea with a middle-aged French woman named Marina Pagés. Marina works as the coordinator for SíPaz, an NGO that has done “solidarity work” with the Zapatistas since the uprising. By that time, we had been in Mexico for about a week, and we’d been scrolling through the SíPaz website pages for months. However, we still hadn’t quite figured out what “solidarity work” meant beyond, as Naomi Klein put it, “guilty lefties with a Latin American fetish” caravaning down to Chiapas to try to see the movement for themselves. We asked Marina one question: what, exactly, did organizations like SíPaz do? Like a typical French Marxist, she answered that question with an hour-long history of how international political economy influenced the Zapatistas and the leftists they’ve interacted with. By the mid-’90s, leftists around the world had watched the Berlin Wall fall, symbolizing the end of Soviet-style communism and its totalitarian horrors. “The international world was disenchanted with the left,” Marina explained. “Supposedly, we were at the end of history, and capitalism had won.” Only a resolute few remained committed to anti-capitalism. They saw that neoliberal ideology was taking hold of nearly every world power, and they were yearning for some other model of how to oppose it. Historical happenstance and good strategy came together to ensure that the Zapatista movement would resonate with lost leftists around the world, and even recruit some new ones. Marina painted Subcomandante Marcos as a brilliant politician, a leader who used his rhetorical gifts to market himself and his movement to the global left, in order to appeal to egalitarian sympathies and thereby protect his cause. It paid off, considering that it was the pressure from international sympathizers and humanitarian groups that kept the Mexican government from trampling the movement in the first place. In framing it this way, Marina wasn’t implying that the Zapatistas were disingenuous in their support for other struggles. Marina was merely pointing out the naivety of treating the phrase “We are all Zapatistas” literally, rather than a rhetorical device they use to recruit sympathizers and make them feel part of the movement. While dialogue with the outside world remains important to them, the Zapatistas are rarely willing to let the outside in. The NGOs most involved with Zapatistas today recognize the continued importance of international awareness, and employ it to the benefit of the Zapatistas and other indigenous communities. A handful of dedicated researchers working for SíPaz document events in Chiapas which threaten the autonomy and safety of indigenous people living in the region—paramilitary violence, threats to their land, and violations of their rights. They publish information on those events, and sympathizers use that information to help make the public case for ensuring the continued autonomy of Zapatistas. Another NGO we spoke with, FrayBa, organizes brigados civiles de observación (civil observation bricades) composed of international sympathizers live in indigenous communities for a few weeks or months at a time and to document violent action against the communities. Because the people who do that work are usually white or white-passing, their presence often effectively deters military and paramilitary violence in the first place—groups who would otherwise threaten the safety of communities refrain, because they know that the media will go nuts if a foreigner is harmed. In FrayBa’s view, the best way for people like us to support the movement was to leverage our privilege—an admirable, although perhaps less exhilarating, goal. Marina from SíPaz was also sober about that: she knew that her role was to provide what the Zapatistas said they needed, not to tell them what to do. Some of the leftist sympathizers we met hanging out in San Cristóbal—mostly Europeans and South Americans —were like us: initially naive about how close to the movement they could get, but willing to listen and sober up to reality. But others were apt to say things like “I am a Zapatista,” and to carry themselves with an air that they were close to the inner workings of the movement. These leftists seemed to believe that by declaring support for the Zapatistas, they were freeing themselves from the worries of privilege once and for all, even if they weren’t actually doing anything besides stewing in their revolutionary dreams. The center is the brainchild of a man known as Dr. Raymundo. He started the center in 1989 in order to educate indigenous youth, many of whom never had the chance to go to school. He believed that the subjects taught in traditional Mexican schools don’t serve indigenous students unless they plan to leave their communities and begin a long climb up the social ladder of the neoliberal economy. Dr. Raymundo, a close supporter of the Zapatista movement, wanted to give them another option. So CIDECI teaches crafts that young people can use to serve their communities, like carpentry, painting, auto repair, cooking, and farming. CIDECI serves indigenous students between the ages of 12 and 24 (sometimes even younger, if they come with an older sibling) from around San Cristóbal and smaller communities throughout Mexico and Central America. The only admission requirement is a letter of recommendation from the student’s community. Students can choose what they want to learn, stay at the campus for however long they like, and receive room and board, completely free. In exchange, the furniture they build, the murals they paint, the livestock they raise, and the bread they bake in their classes goes back to CIDECI. Dr. Raymundo conceives of CIDECI as more than a trade school. He told us that he believes CIDECI is a “crack” in the capitalist system, a place where alternative ways of communal living can flourish, and, little by little, work to split the system open. To this end, CIDECI holds an open seminar every Thursday, where indigenous students, community members, and a gaggle of unaffiliated sympathizers gather to discuss oppression and resistance around the world. The seminars we went to usually attracted at least 30 to 40 participants who would filter in and out over the course of three hours or more. The seminars always started with a summary of the week’s readings in Tzotzil, then Spanish. It takes almost an hour to recite the readings, which are essentially a list of recent atrocities in Chiapas and around the world: a news article about a group that was trying to take Zapatista territory, a message from “water defenders” in the neighboring state of Oaxaca, news about the latest genocides around the world. After the summary, participants are invited to join in a discussion of the readings. Ethan and I quickly learned, however, that “discussion” mostly meant long, impassioned speeches affirming one’s commitment to the fight against capitalism. Dramatic indictments like, “Genocide hides amidst the many heads of the capitalist hydra,” were not uncommon. Originally, Ethan and I thought the seminars would help us understand the movement theoretically. We expected that they might help us think about how Zapatista ideology could apply to our political situation. But although the seminars were extremely powerful, they weren’t really about theory. They were about recognizing the continued prevalence of injustice. Around those hand-carved wooden tables and chairs, emotions ran deep. There was one indigenous woman who went to every seminar we attended. She had the kind of quiet, elderly frailty that made me worry she might topple over at any moment. But it was this same quality that gave her an air of wisdom, like she knew the path to hell and back. During the discussion portion of one seminar, she stood up and introduced herself as Compañera Maria. The room fell completely silent. She recounted growing up before the Zapatistas had risen, and how she had felt there was no hope for her community’s future. She had since committed her whole life to the movement and her people. She spoke about how she felt her ancestors behind her. She talked about how she felt the lucha, the fight against the oppressors, in her heart. The fight itself gave her people dignity, she said. Compañera Maria’s speech brought to me the verge of tears. She was describing the empowering force of the struggle itself. She, like all Zapatistas, had not only recognized her right to a dignified life, but had taken it by force and defended it with her whole being. At the same time, I realized I would never feel the lucha in my heart in the same way she had. The raw power of Compañera Maria’s words made sympathetic leftists’ attempts to replicate the spirit of her speech seem disingenuous. Marina, of SíPaz, had identified this phenomenon for us. “So many different people feel that they can just insert themselves into the movement,” she explained. German anarchists, or French Marxists, or, say, American college students look at the movement and see themselves in it. They romanticize the way that people who have been truly oppressed feel the struggle. But the fact that we were all together at the same table, calling each other compa, obscured the enormous cultural and economic divide that we would never bridge. Seated on one side were indigenous people from rural Chiapas, fighting to put food on the table and to keep their culture alive. We could get a glimpse into this struggle, but it would never be our own. After the seminar, we would pile into a car with a bunch of French Marxists and drive back to the center of San Cristóbal, a tourist hub where we could buy organic vegetables and fresh-made pasta at bourgeois restaurants. Compañera Maria, needless to say, would not. 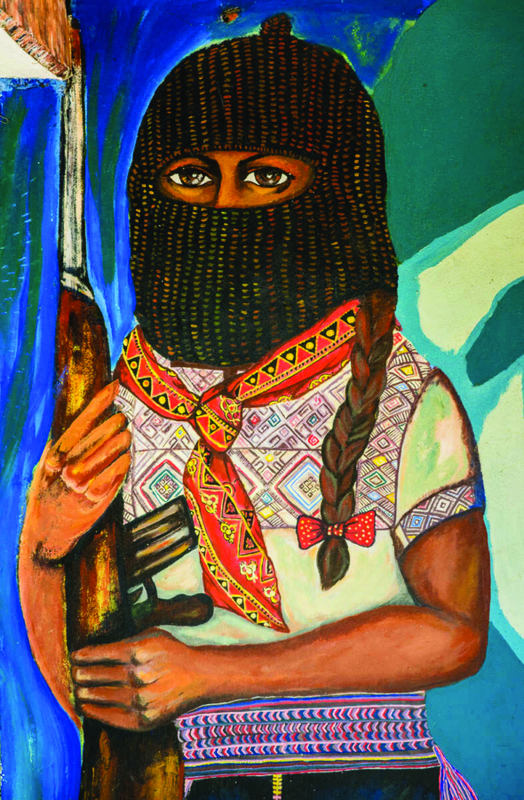 Most Zapatistas have only seen the world of constant commodification and consumerism from afar. Prior to the uprising, they were the ones breaking their backs in factories or farms in order to provide for the consumer class. They weren’t getting any of the benefits of capitalism. So it wasn’t all that hard for the EZLN to convince poor indigenous campesinos that capitalism—the system under which their land and life had been torn from them—was unjust. But for we who reap the comforts of the capitalist system, the injustice is hard to feel on a personal level, and even when we know it exists, it’s easy to brush aside. While the Zapatista movement has inspired other disenfranchised groups to take back their land and defend their dignity themselves, it shouldn’t have come as a surprise that they don’t have some theoretical brilliance to offer Americans like me and Ethan. While we can certainly support the Zapatistas, we have no pre-existing anti-capitalist framework to work off of, no villages in the mountains where we can find a communal spirit that runs deep in a centuries-old tradition. The Zapatistas, rightly, fight back against systems of oppression in part by retreating from them. But we have no such option: we have to confront the mess of the modern world. That mess hit us immediately after the French Marxists dropped us off in San Cristóbal, where an indigenous boy, probably eight or nine years old, walked up to us on the street with his hands outstretched, silently. It was a scene we had been accustomed to by that point—over 3,500 indigenous villagers have been displaced to the city, where many live in poverty, selling souvenirs to tourists or begging on the street to survive. The best response I could come up with was to smile and give the boy some of my spare change. Maybe he ate that day. But he would spend the next day, and the day after that, wandering around the streets, getting shoved off by locals and ignored by tourists. That boy did not get the chance to reclaim his right to a dignified life, and the balaclava-clad revolutionaries up in the hills weren’t going to bring it to him. The story of my attempt to reconcile the contradictions of this ill-fated journey begins on another sweltering day in the remote foothills of Chiapas. I was nauseous once again (street food, weak American stomach, etc.). But, embarrassed of my typical tourists’ condition, I didn’t want to show any weakness. Even though I was on the verge of passing out, I continued to hike through the thorny bush, alongside Ethan and a small, weathered man named Martín López López. We knew almost nothing else about Martín when we called him one day from San Cristóbal and told him we were friends of Alberto. Immediately, Martín invited us to his house for breakfast and said we were welcome to spend the day following him around. He ended up giving us a tour of his small farm, formerly part of a communally-owned ejido. He showed us around his land, pointing out each crop with a sense of wonder and pride. Ethan and I exchanged a glance that said, Ohhh. The corn guy. Martín is not a Zapatista. He’s actually not indigenous, and he’s not even from Chiapas—he’s a transplant from a central Mexican province who came to San Cristóbal because he could see that here, political struggle was alive. We quickly discovered that Martín was much more than “the corn guy.” Calling Martin “the corn guy” is kind of like calling Karl Marx “the beard guy.” It’s a side project he’s proud of, but it’s definitely not his main gig. Martín has been a community activist and educator for most of his life, albeit through different forms. He grew up a devout Catholic and believed in God fiercely. He renounced marriage, promising himself to God. In his twenties, he joined the church as a missionary and was sent to the campo of Chiapas to Catholicize indigenous communities. It was there that, one day, he woke up and realized that God did not exist. Martín’s revelation was a crisis that he faced completely alone. After spending years telling people that God would save them, he knew he couldn’t tell them that God didn’t exist. It wasn’t his job, he explained to me later. So instead of resolving himself to nihilism, he stayed in his position as a missionary and taught himself to read the entire Bible from a humanist perspective. Sure, the story of Jesus walking on water is likely a myth, but the stories of Jesus talking to people and giving bread to the poor could be entirely real. He was surprised to find that the Biblical verses he had grown up thinking were divine didn’t cease to amaze him once he realized that they were only the work of human beings. In fact, the stories began to strike him even more. If humans could create an entire theology that pointed toward a message of love and forgiveness, maybe someday they might be able to follow it. In that way, Martín is not unlike Subcomandante Marcos. As the story goes, Marcos was once a philosophy professor in Mexico City. When he arrived in the jungles of Chiapas in the ‘80s, he was a hardline communist who intended to organize the indigenous poor into a Leninist “vanguard party” that could overthrow the state. But when he got there, he found a fledgling army composed of campesinos teaching themselves survival tactics, community organizing, and Mexican history. Marcos realized that the indigenous people might have more to teach them than vice versa. Marcos and his mestizo friends set out to help the campesinos do what they were already doing. They organized a recruitment campaign, convincing villagers who were already engaged in civil resistance to join their clandestine camps in the jungle. Their parallel stories took place at the same time, too. In fact, Martín told us that before the Zapatista movement went public, he did missionary work with some of the communities in what would soon become rebel territory. He talked with them about organizing and defending their dignity, inadvertently telling them they should rise up. Moreover, Catholic liberation theology was a key factor in helping indigenous people recognize their rights, paving the way for them to organize. Bishop Samuel Ruíz, under whom Martín worked, was a fierce defender of indigenous autonomy, and the principal mediator of the peace talks between the EZLN and the government. Martín eventually left his position as a missionary, but he didn’t stop working for the good of others. He left Chiapas to study education. In one of his classes, he met a woman named Silvia, whom he would later marry. Silvia and Martín agreed that the way they’d been taught to teach didn’t allow students to raise real, radical questions or think critically about the world. They had been told that their job as teachers was essentially to deposit important information in the empty vaults of students’ minds. But Martín was skeptical. He had learned more about life from illiterate campesinos than his professors at university. He didn’t feel that his formal education qualified him to be an authoritative source of knowledge in the first place, so when he and Silvia moved back to Chiapas and began teaching, they did it their own way. Influenced by Paulo Freire’s landmark book, “Pedagogy of the Oppressed,” they wanted to teach in a way that acknowledged that truth was not dispensed by an authority, but rather something students and teachers alike had to reason out, even create, for themselves. On a basic level, this meant that instead of telling elementary school students that Coca Cola is bad for them and pozol, the traditional drink of the region, is healthy, Martín would ask them to make a list of the differences between Coca Cola and pozol and decide for themselves. On a more serious level, this meant that instead of yelling at religious conservatives about tolerance, he would ask them what Jesus wanted: love or hatred? Now, Silvia and Martín have retired from their classrooms and run an NGO called Educreando, in which they teach this pedagogy to other educators from all backgrounds—priests, public school teachers, private tutors, and politicians from any side of the spectrum. Martín is willing to work with anyone. To show us how it worked, Martín took Ethan and me to an elementary school classroom in a small city outside of San Cristóbal called Teopisca, where he had been working with a dedicated teacher named Hugo. The public school system in these majority-indigenous areas is extremely underfunded. But Hugo, with Martín’s help, was going beyond the resources of the classroom to give his students the education he felt they deserved. He had helped the students build an oven in the courtyard, taught them indigenous languages, and organized musical performances that reflected their cultural roots. It was easy see that Hugo was changing these students’ lives. Ethan and I had thought our day with Martín would be a distraction from the main task—we were, after all, supposedly conducting a historical and philosophical investigation into the Zapatista movement. It was difficult to see how an ex-Catholic missionary who runs a nonprofit would fit into all of this. But Martín gave us a sense of hope, a possible antidote to our previous confusion about how the Zapatista movement was supposed to inspire anything for our political system. It wasn’t that Martin was doing something better than what the Zapatistas had accomplished. But he was doing something more effective than the French Marxist at the CIDECI seminar stewing in resentment at the bourgeoisie and returning to town to chow down organic pasta. In a weird way, Martín action aligned more with the ideals of the Zapatista movement than many of those leftists did. Rather than searching in vain for a way out of the world we inhabit, Martín was working within his own community to transform it. While Mexican politics has been plagued by corruption for most of this century, local politics in Chiapas are increasingly active. Martín has helped his neighborhood organize, recruit participants for the neighborhood council, and lead efforts to clean up the river that runs through San Cristóbal. I went with Martín to a community meeting that he organized. He knew everybody—the politicians, the abuela concerned about her grandchildren playing in the river, the businessman who remembered days when you could drink straight from the source. And they all deeply respected Martín. He had somehow brought this group of people together, not to plead with the city government to clean up the river, but to figure out how to do it themselves. Martín explained that in the U.S., and even in most of Mexico, we tend to believe that the government’s job is to grant us what we think we deserve: build us roads, give us social programs, care for the sick and the poor. But Martín and his compañeros see this as essentially contrary to the idea of autonomy. Both Martín and the Zapatistas believe the people should be empowered to do things for their own communities, and that the government’s job is to respect and enable that. At one point, Martín even invoked the principle of mandar obedeciendo (govern by obeying), the Zapatista aphorism that we had encountered outside of Oventic’s gates. It’s not that Martín is free from apparent contradiction. He too, enjoys organic pasta in the touristy center of San Cristóbal. He and Silvia live a modest life, but they own plenty of comforts that depend on capitalism. And for all his talk about avoiding dogma, Martín has strong opinions. I think Martín is aware of these contradictions, but he seems to have reconciled with them. Perhaps that’s because his life’s work isn’t to realize the creation of the perfect society, or to ensure his own moral purity, but to walk with and learn from others. I tried to imagine Martín asking some ultra-conservative party politician whether Jesus wanted love or hatred. I was skeptical that his method would actually work. “When you’ve done this dialogue with really religious people, maybe with really conservative people, how does it go?” I asked him. Martín replied quickly and calmly. “They change a little bit,” he said. In the heat of the day, I felt chills down my spine. There was a powerful optimism in Martin’s words. Martín’s radical politics didn’t consist of blindly idealizing the Zapatista movement and fuming about the capitalist system we may never be able to change. Instead, Martín showed us a path to another world: working to change people’s perspectives, a little bit at a time, knowing that we could never have all the answers. Martín knew from his own experience that people could change. That was enough to fuel his work, and that was his way of making another world possible.